So this is part where threading comes to play. It will read data from weather endpoint each 10 minutes and from forecast endpoint each hour. Next it will parse data to our format and store it. So when we ask our package for weather date it will return it from cache. So hopefully you have some experience in python programming, I wont dig into basic things. We will be using Python 2.7 on Raspberry Pi. But coding is on windows machine on mapped drive. Home directory on Raspi is mapped to drive S: on my main computer. There will be some functions or structures that are not necessary in this tutorial but necessary in RaspiCmd. So I just left them and reused. Such thing is worker.py file. We can live without it and move all functions to other file. Another thing are start() and stop() functions. I will try and point out such places. IDE that I’m using is PyCharm. Setting remote interpreter to Raspi allows us to have a full code completion. 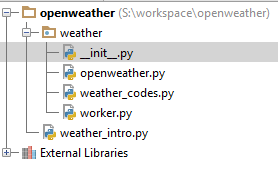 Start your favourite IDE (PyCharm :)), create new project (openweather) and new package (weather). Now create some empty files: weather/__init__.py, weather/openweather.py, weather/weather_codes.py, weather/worker.py and weather_intro.py. If you need translate all codes to short form. My system is using worker file as controller for main package body. Function defined in it are callable from system. That’s why in this tutorial we will be using such file. This worker is very simple and gives us four functions. Start and shutdown are required by system. For user are weather and forecast. We import class Weather that will have all functions, all algorithms and thread. It will do main job. We will take care of it later. Next we define Worker class and constructor __init__(self, core). Variable core is not used in this tutorial so you may remove it or just pass None when creating class. Most important thing is self.handler as it creates main class. In a parameter we send dictionary with our cities. In function init(self) we have defined cities to watch, two ids and city names. Functions start(self) and shutdown(self) are required by system and I just left them and reused. They start and stop Weather thread that download JSON from endpoints and parse them. """main loop, reads data from openweather server"""
"""fetch json data from server"""
Lets start from __init__(self, cities). We set basic variables and define endpoint urls. First is self.tick dictionary. Its made that way to avoid common problem. When thread enter time.sleep(n) it will stuck on it. So when sleeping for 10 minutes you press ctrl+c to abort program it wont happen. Thread will be waiting for sleep to end and your program will hangs. So to minimize sleep gap thread is sleeping in small intervals 10 seconds. And each tick increments counters (_wcounter and _fcounter) and when they go over limit (weather_counter, forecast_counter) main functions are called. Variable weather_row_stub define how our return record looks alike. Endpoint urls are stored in url_current and url_forecast. If you look at the end of url_forecast you will see number 4. It define for how many days we want a forecast. Function run(self) is responsible for doing two calls to openweathermap. Lets see how it works. In while are two ifs, sleep and counters. So each while loop do job and sleep for self.tick[‘sleep’] – 10s by defaults and increase counters. What is important sleeps takes 10s but ifs are activated according to defined thresholds. In while self.work are two ifs. They activate when corresponding counter reaches threshold. First (_wcounter) activate current weather fetch and second calls weather forecast endpoint. Forecast is done almost same way. Call is made, decoded to JSON and stored. Two functions are responsible for returning data to user. They are called from worker.py. Its weather(self, city_id=None) and forecast(self, city_id=None, date=None). Last important function is _fetch_data(self, url). It builds urllib request and read data from endpoint. Received data is parsed to JSON format. If any error occur function return None. Functions that decode received JSON are just simple assignment to our array. Now run this script and you will see some weather data. In first or even second loop you will probably see empty values – data is not received from server. But after third you should see two records with full data. And that is all. Have fun playing and optimizing code.